Upon entering Dan Schlanger’s home on the first morning of summer, I hardly expected to see him sink his hand into a large bowl of basil, then inspect and discard some of the wilted leaves. “We’ll make pesto from it,” Schlanger explains from the kitchen table as his wife Ellie snuggles their four-month-old daughter Eden. The herb-centric activity isn’t a far cry from Schlanger’s first career as an organic farmer in central California, where he rented land and sold the vegetables he grew to San Francisco-area restaurants. That exposure to open spaces also is what drew Schlanger, now 44, and Ellie, 33, to settle in Katzrin, in the Golan Heights. While Katzrin seems far from Israel’s main population centers along the coastal plain, it’s really just a two-hour drive to Ben-Gurion Airport, Dan says – and he would know. He kept his New York-based law practice, works East Coast hours from Israel, but returns for about one week every month to meet with clients. The Schlangers landed in Katzrin thanks, in part, to a Nefesh B’Nefesh-organized pilot trip in its Go North initiative that encourages new immigrants to settle in northern Israel. 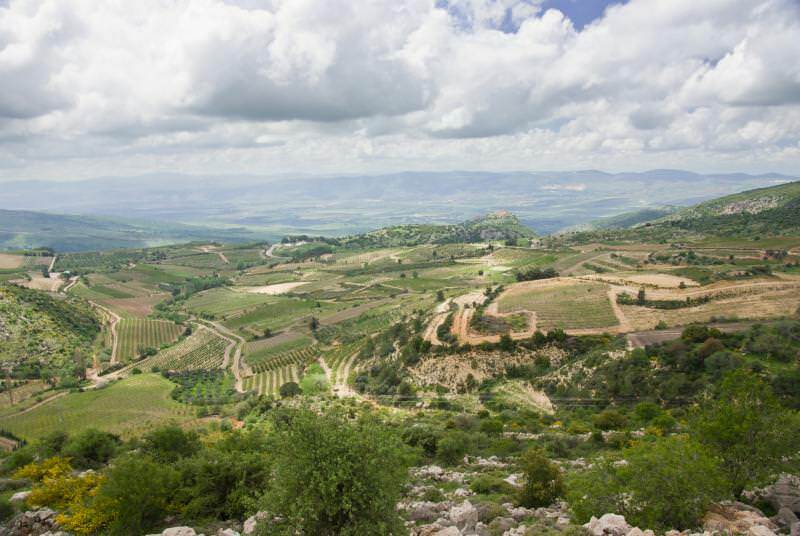 The Golan Heights are in the remote, northeast corner of the country. Approximately 15,000 Jews live in the territory, half of them in Katzrin. The 2013 pilot trip took participants to towns like Nahariya, Tzfat and Karmiel, but partway through the Schlangers decided to rent a car to explore Moshavim and smaller communities on their own. When they moved to Israel two years later, they decided to make Katzrin their base for exploring the Golan’s Moshavim to decide on which one they’d settle. Instead, Katzrin became their home. In August 2016, the Schlangers bought this large house – it features six bedrooms, four bathrooms and a basement – after a year of renting a home nearby. It has plenty of space for them, their four children (the eldest is seven years old) and everything they shipped from the United States. Dan estimates that under 60 English-speaking families live in town, but that’s okay with him and Ellie. They weren’t interested in what Dan calls “an English-speaking enclave” in Israel. Still, fellow Anglos “have been a community for us,” and that community is growing, Ellie says. The Schlangers belong to several Facebook groups of English speakers living on the Golan. They attend three synagogues. The family enjoys going to the playground down the street, cooling off at sprinklers in several parks, visiting a small zoo where some animals can be petted, jumping in the above-ground pool of their next-door neighbors or the built-in indoor and outdoor pools at the country club, and enjoying varied activities at the community center: art, playing board games, gymnastics and karate classes and doing padded rock climbing.